It’s a question we’ve been pondering for a while, and with much more intensity in recent days: does Google care about Palm webOS? It is something we have to wonder about, with Google Maps on webOS lagging greatly behind its iPhone and Android counterparts, webOS being at first excluded from the Buzz party and then only invited inside the lobby, and the general lack of effort Google seems to be publicly exerting in getting their products to work to their full potential on webOS. It all came to a head last week, with Google making a change to the way Google Voice works that ended up breaking webOS Google Voice clients, such as the popular gDial Pro. Nathan, the developer of gDial, learned that the change was not a move to break compatibility with unofficial Voice clients like gDial, but a natural progression of the development of the Google Voice system. In fact, Google has no problems with such unofficial clients and is pretty much willing to turn a blind eye to them so long as they aren’t acting in nefarious ways. Unfortunately, that blind eye doesn’t come with any support. Google does have newer APIs to support Voice clients, but as the Nathan also discovered, webOS is also lacking in the kind of support that gDial now needs. Google’s new API requires that the app have control over things like user agents and cookies. Currently, the Mojo SDK is not set up to give developers like Nathan sufficient control of such things. This left Nathan in a lurch with the development of gDial, which had up to this point been a free-to-download and free-to-use app. The only solution was, at least for the time being, to move to a server-side authentication solution, which now meant that he needed to figure out some way to pay for continual server support. This server-assisted solution forced Nathan’s hand, and now the updated version of gDial Pro does work properly again. A full explanation of how the new system works is on the gDial website, but suffice to some features now require a $1/month service charge to pay for the server until webOS and Google Voice can work in harmony again. When will that be? Nathan spoke with engineers at Palm as well and found that the support needed in webOS will not be coming in webOS 1.4, which is little surprise. While Palm is willing to work with developers to roll new capabilities into webOS, the changes needed to re-enable seamless on-device server-free support for gDial will require larger changes to the way webOS handles apps and their access to certain files. As such, those changes won’t come until another major 1.X update, which may be several weeks off at the earliest. At its current pace Palm is averaging just under two months per 1.X webOS update, with webOS 1.4 expected sometime this month. For comparison’s sake, let’s look at a requested feature that crops up in the comments every time we mention Google Maps: Street View. The street-level 360 images have proven extremely popular with Maps users and the feature has made its way onto the Android, iPhone, BlackBerry, S60, and Windows Mobile versions of Google Maps. In the desktop browser, Street View is a Flash-based experience, and while we suspect that Google is working on a web standards version of Street View, the standards, technology, and adoption just haven’t met in the middle to provide as seamless of an experience as Google would prefer. With a rapidly expanding customer base, webOS is poised to become a notable player in the smartphone market. Being that Google is Google, they want to have their hands into everything, which means getting their services onto as many platforms as possible. We have little doubt that Google wants to bring full support for Street View, Buzz, Voice, and all their other popular and services to webOS. 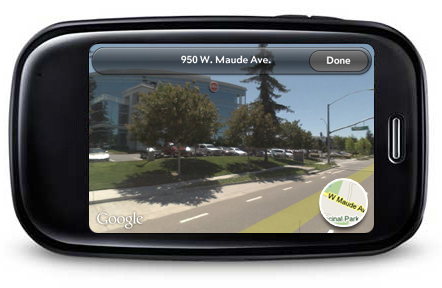 After all, they made Google Maps for Palm OS in 2007, a platform that everybody knew was going nowhere fast. Huge thanks to Nathan for helping us understand all of this!